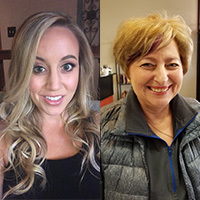 Two Webster University nursing graduates received awards from Delta Lambda At Large Chapter of Sigma Theta Tau International [Sigma], an international honor society of nursing. This year, 11 Webster University nursing graduates joined Sigma. Established in 1922 by six nursing students at Indiana University, Sigma has 135,000 members from 500 chapters and representing 90 countries. Sigma promotes leadership and scholarship of nursing and advocates for global health. Alla Mink received the Janice Hooper Undergraduate Student Award, recognizing her for excellent leadership, compassionate care, and service. This award is named in honor of Dr. Janice Hooper a former department chair and a long-time champion of the promotion of excellence in nursing education. Mink has been a nurse for over 22 years and currently works as a staff nurse in the St. Louis Children’s Hospital neonatal intensive care unit. One faculty member stated, “Alla is generous with her time to other students. She sometimes arrives early or stays after class to mentor other students to success”. Bilingual in English and Russian, Mink has served as a Russian translator for the Project Restoration Mission for Belorussian children in St. Louis and on a medical mission. Maegan Bosler was honored with the Webster University Graduate Student Award. Bolser works as a Staff Nurse at Barnes-Jewish Hospital, since 2010. In addition, she is an adjunct instructor at Saint Louis University School of Nursing where she teaches in several programs and several areas including in the Health Assessment lab and in the interprofessional education program. Webster's 38-year old Department of Nursing offers a Bachelor of Science in Nursing and a Master of Science in Nursing to registered nurses seeking to further their education and advance in their career. The nursing curricula focus on preparing today's nurses for the rapidly evolving healthcare industry and the increasingly vital role that nurses play in supporting and advocating for the health of our communities.